Besides the obvious emotional factors, money is a primary concern when it comes to ending your marriage. When it comes to attorneys' fees, they usually vary by locale, the complexity of the case, and sometimes even the attorney's skill level. Whether you have hired an attorney to represent you or have completed your own divorce papers online with DivorceWriter, you will need to pay a filing fee charged by the Court Clerk's office when you file for divorce. While divorce filing fees vary from state to state and often from county to county, nationwide they typically range from $100-$350. Leading the pack with the highest divorce filing fees in the country are Florida and Minnesota, hovering at $400 or more. Likewise, California has a statewide filing fee of $435, which was actually reduced from $450 in 2014. 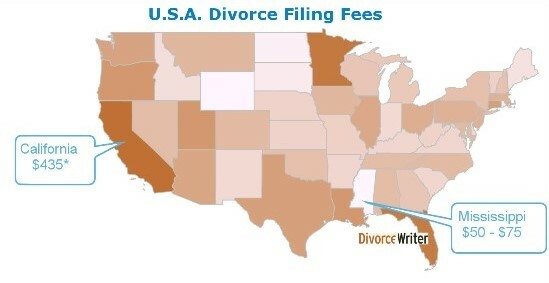 On the cheaper side, Mississippi, Wyoming, and the Dakotas have divorce filing fees falling under $100. Why do the fees differ so much? Filing fees are set by state legislatures and county commissioners, and are subject to change without notice. Depending on your state and county, you may be able to find a detailed breakdown of how your filing fee is spent. In states where divorce filing fees differ from county to county, generally, the most populous counties charge the most. That being said, across a given state, the fees charged rarely vary by more than $100. Many states also charge a higher filing fee (usually $10 to $50) for divorces involving minor children. This is because there's more paperwork and the Court anticipates spending additional time in reviewing documents to ensure that child support, custody and parenting time arrangements are in the best interests of the children, even in uncontested cases where the parents agree on these matters. Can I just file in the cheapest state? Generally, forum shopping, which is the process of filing a case in a state with more favorable laws, lower fees, etc., isn't effective in divorce because you must meet the state's minimum residency requirements to file for divorce there. However, if you and your spouse live in different states and both of you meet the residency requirements where you live, you may generally file in either state. For example, if you reside in California and want to divorce your spouse who lives in Mississippi, you may want to consider divorcing in Mississippi, where the filing fee could easily be $300 less than in California. If you and your spouse live in the same state, but different counties, and the filing fee is considerably less in the county where your spouse resides, you may consider filing there instead of your home county. While filing fees tend to vary less than $100 among counties in a state, the idea of saving $100 may be enough incentive to travel to your spouse's home county to file your divorce. Moreover, in a few states, the difference between counties can be even more significant. Be careful when filing—don't pay more than you have to! In some states, in order to speed up the divorce process the non-filing spouse can file a document in response to the divorce called an Answer, even when spouses agree on all issues. However, in many other states, an Answer should not be filed in an uncontested divorce since filing one will trigger a response fee. In such states, the response fee is usually almost as much as the filing fee that you paid to start the divorce. In California, for example, although you must give your spouse a Response form as a formality, it doesn't need to be filed if in an uncontested case. In fact, if your spouse does file the Response, he or she will be forced to pay a $435 response fee, which is in addition to the $435 fee charged when the divorce was filed. As of August 2017, the fee to file a new dissolution of marriage case in Cook County is $368.00. If you are asked to pay $605.00 instead of $368.00, then the Clerk's office is attempting to also charge you the $237.00 response fee in addition to the divorce filing fee. However, a response fee is paid if, and only if, your spouse files a responsive pleading like an Answer after being served with divorce papers. As the Petitioner, all you should have to pay when you file your Petition for Dissolution of Marriage is $368.00. If your spouse, as the Respondent, files an Answer or other responsive pleading later, he or she will pay the $237.00 response fee. There are other ways to keep divorce filing fees to a minimum. Filing a joint petition or having your spouse sign a document accepting service are two methods commonly available to avoid the need to pay for formal service of divorce papers by a Sheriff or professional process server. Additionally, in some states, the filing fee goes up if the divorce is contested so reaching an agreement can save big bucks. In Vermont, for example, the filing fee is $78.50 when both parties sign a Final Stipulation outlining the terms of their final divorce agreement. When no Final Stipulation is filed, however, the filing fee is $262. Can I get the court to waive the filing fee? Every state gives the option of applying for a fee waiver. Generally, this involves filing a motion asking the judge assigned to your case to allow you to file for divorce without paying the filing fee due to economic hardship. A sworn affidavit stating that you are unable to pay the filing fee and explaining your income and expenses must also be filed with the motion. Some judges may require a hearing before ruling on the motion to waive filing fees, but many will deny or grant the request based solely on the information in the motion and affidavit. In many states, qualifying for a fee waiver is difficult because it requires the filer to have an income that falls well below the federal poverty level. Most people will file for divorce in the county where either they or their spouses reside. Short of being granted a fee waiver, there isn't anything that can be done to avoid paying a filing fee if you want to get divorced. However, there are a number of ways to minimize paying additional fees to the Court. Avoiding response fees by not having your spouse file an unnecessary Answer, having your spouse sign a document waiving formal service of divorce papers by a process server, and agreeing on all issues before filing for divorce to avoid the increased fee sometimes charged for contested divorces are all ways to keep the final cost of your divorce to a minimum. Divorce papers prepared on DivorceWriter come with detailed filing instructions and all of the documents needed to complete your divorce as inexpensively as possible. Divorce Residency Requirements - U.S. State & County Requirements.